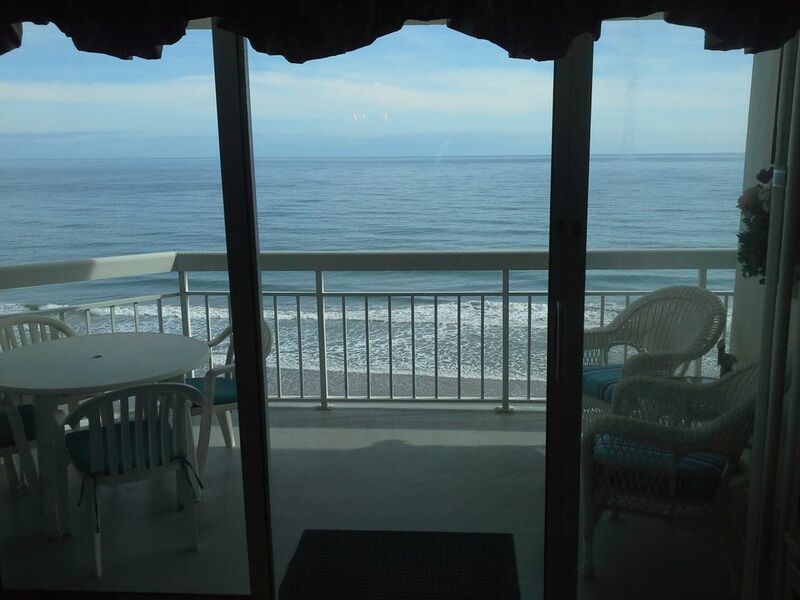 We have recently upgraded our 3 bedroom oceanfront condo. Our master bedroom now has a brand new bedroom suite including a very comfortable Euro top mattress set. We have also recently installed porcelain tile throughout all of the condo and replaced our stove with a new GE self cleaning range. We have area rugs in the Living Room, Hallways and all three Bedrooms to make the areas more comfortable. Our condo is on the sixth-floor and has a beautiful view from a large private balcony off the spacious living room with an adjoining balcony for the Master Bedroom . Our 'Home Away From Home' sleeps six to eight. Master bedroom has a new king-sized Euro top mattress set. the middle bedroom has a queen sized bed plus the back bedroom has another king sized bedroom suite with a plush firm mattress set. There are two comfortable queen-sized sleeper sofas in the living-room PLUS a NEW recliner that swivels and has glider feature. Two full baths and half bath in hallway. There is a fully-equipped kitchen, large living and dining areas. Also has full-sized washer and dryer, four TVs, two VCRs, two DVD players, stereo with CD player, ceiling fans in all bedrooms and dining room. The on-site facilities include attached covered parking garage, exercise room, indoor pool (heated October to May), outdoor pool, indoor and outdoor hot tubs, large sun deck, grill, gift shop/convenience store, and lounge. Sorry, no pets and this is a non-smoking condominium. Note that $200 security deposit will be refunded if condo is left in good condition and keys returned. We are both retired and enjoy our opportunities to spend time at our condos. We try to make them comfortable and cheerful. Many of our guests have become very good friends as we share our experiences. We vacationed at this resort for six or seven years before buying our first condo. After looking at various condos up and down the beach, we settled on this resort because it has the amenities and location that suited us best. When we were in the market for 2 and 3 bedroom condos we determined that this was still the best location for our needs. See VRBO ID Nos. 403793 and 49050. The name of our resort is Water's Edge and the name is very accurate. It is hard to find a resort that gives you easier access to the beach and ocean. We also have a new property management company and our resort has not looked this good since it was first built. This resort is about as close to the ocean as possible. Outdoor and indoor pool. The indoor pool is heated from October through May. We enjoyed our experience at this condo. The owners are great to work with and answered any questions we had promptly. Overall the resort is nice but a little dated. The parking garage is connected to the property which is nice, but the elevators seem slow to service 15 floors. The condo was very clean and up to date. Would definitely recommend to anyone looking for a quiet family vacation. Thank you for taking time to post your review. We appreciate the kind words and our goal is for every vacation to be a good memory for all. We have visited Myrtle Beach/Garden City area for the past 7 or 8 years. We have stayed in different places each time and this was by far the best! The unit itself is beautifully decorated, clean and had absolutely everything you could hope to need in the kitchen. (toaster was a little touchy so might need replaced) The beds were super comfortable, the balcony was unbelievable! I just can't say enough good things about this unit. The resort itself could have been a little better but overall still pretty nice...one of the two elevators was out. They said from the storm but I heard others say it had been out in May too so you might check that. It was fine for us in the off season but would be bad during busy times. The people at the resort were friendly and helpful and the pools and hot tubs were awesome. Mr. Kendrick worked with us on our last minute booking (we waited until last minute because my husband has Alzheimer's and another member of our party has some health issues so we weren't sure about travel) All in all I don't think you could go wrong with this unit. We would definitely stay again. Thank you for letting us know about your recent stay in our condo. We are glad that your vacation was enjoyable and hopefully you will be able to come back again. I will check on the toaster and apologize for the elevator being out of service while you were there. The storm did cause water to get into the electronic controls which in turn required replacement of several hard to find items. All should be back to normal soon. My family and I stayed in Sam Kendricks 3 bedroom condo the week of July 25,2015. Extremely nice and comfortable place. Beautiful views but not too high up in the condos. Hope to stay there again next year. Would recommend highly. Kathy George. Mount Airy, N. c.
We had the opportunity to stay in the Kendricks' place in July 2009. We had always stayed next door at Horizon East, but we always wondered what Waters Edge was like, because it looked so nice. We are so glad that we gave it a try and we are equally as glad that we found the Kendricks. This unit is wonderful and is in beautiful condition. We saw some of the other condos in Waters Edge and they do not compare. We have booked our August 2010 vacation in this same unit and we hope to stay there for many years to come as well. The McKays. There are many local restaurants providing a variety of menus including fresh seafood, steaks, pasta and pizza. Linens are included with the above prices. Guests are required to wash and dry the used linens before their departure. Guests may bring their own linens if they prefer.